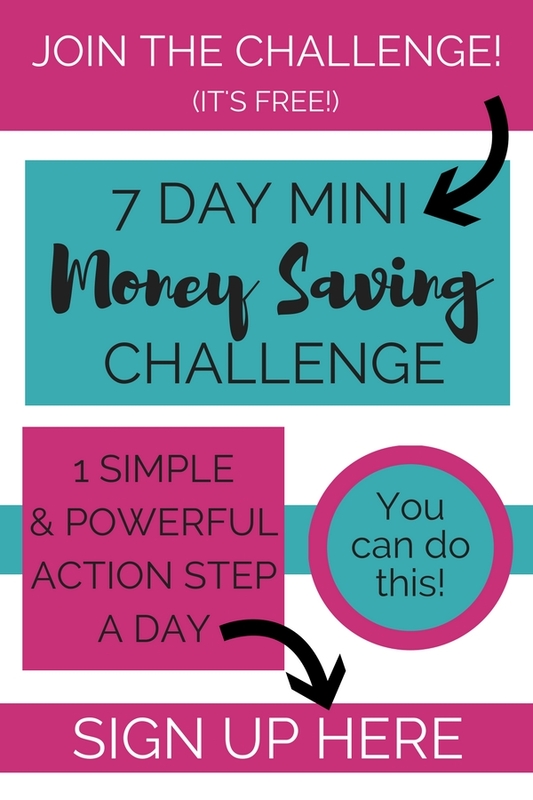 You’ve had a super busy week, working, running errands, doing this and that, you have no time to cook dinner, and you are so over ordering pizza or circling the drive thru? You might feel like there is no hope for you. Like you can’t feed your family a healthy dinner when you have no time to grocery shop or cook. You’ve probably read posts about meal planning and freezer cooking. And it sounds great. But it hasn’t worked for you. Maybe you tried meal planning for a week, life got super busy, and it just didn’t happen. Or maybe you printed a super intense freezing cooking plan and bought everything to make 80 meals in 2 hours. But you never got the 2 hours to make the meals. Well, what if you just started with baby steps? Made a few extra dinners for back up meals on crazy busy nights? What if you started with just 2 recipes, instead of 20? Let’s start from the very beginning and take baby steps towards freezer cooking. You can even make these meals while your catching up on laundry, or the dishes, or the millions of other things on your to do list. 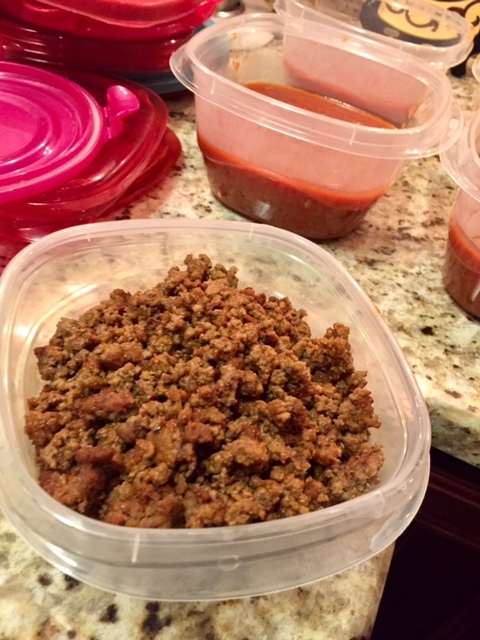 These are the 2 simplest freezer meals that I make very often. Nothing crazy here, just an easy meal for a busy family when the meal plan didn’t happen, when you forgot to thaw your other dinner, or when you forgot all about dinner. These simple meals will be your saving grace when dinner time rolls around, you realize you had no plan, and pizza is not happening again. Is your mind blown with how delicious those sound? Probably not. But that’s okay. The point here isn’t to make the most grand, most delicious, most award winning dinner for your family. What we want is to have something super simple that we can whip up and feed our hangry (hungry + angry) family. To have something warm, homemade, and frugal to put on the table. You may only get 15 minutes to sit down with your family at night. And these meals are perfect to keep them happy and fed, and keep you out of the kitchen and spending time with your family. Freezer cooking is so simple, but can sound so intimidating. All you want to do is make a few extra meals to freeze, that you can easily thaw, heat, and serve. If you are already making a meal, why not multiple it while you have all of the ingredients out, make extra, and freeze the meals for later. 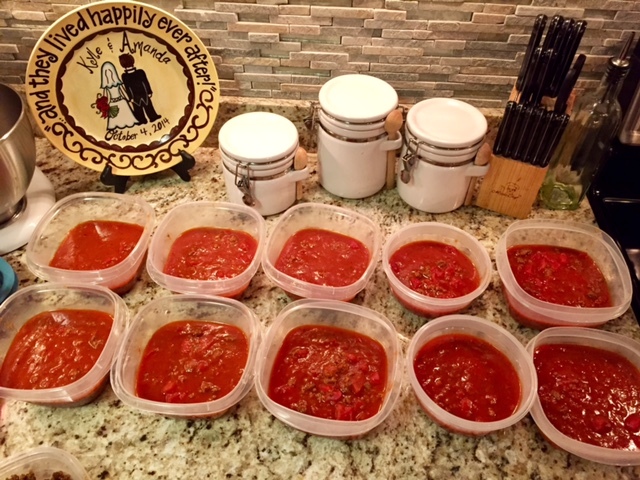 Spaghetti sauce is a favorite in our house. We eat it about once a week. And it’s one of the easiest things to make! Portion the sauce up by your family size in freezer containers, label, and stick in the freezer. When ready to serve: Let thaw overnight (or heat from frozen – just will take longer), heat in stove pot, boil noodles, combine and devour. This made 10 containers for the 2 of us, so it should be about 20 servings overall. Multiply it to make more! I love having taco meat already cooked up in the freezer. We can have tacos, nachos, or a taco salad for a super quick meal. 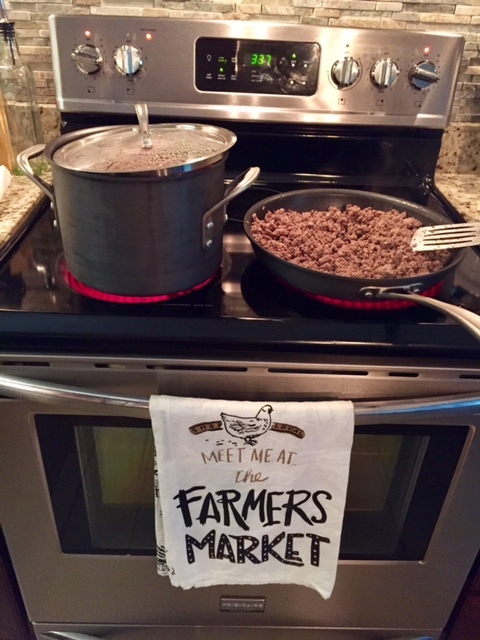 Using the same large skillet from before, add your ground beef to brown. Drain grease in strainer and large bowl. 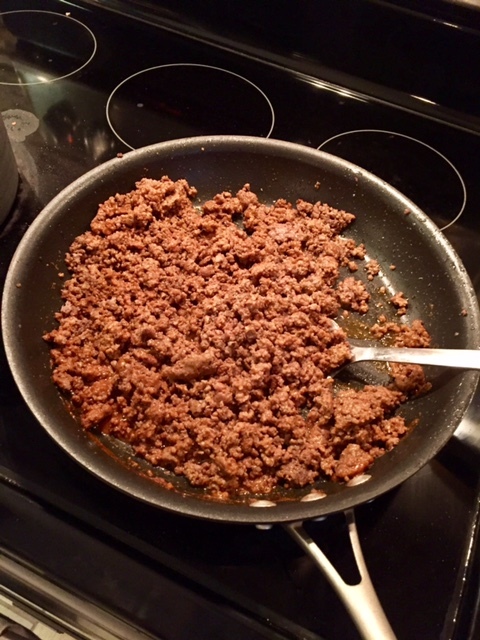 Mix the taco seasoning packet with 2/3 cup water and add mix to beef. Let boil, then simmer until mixed well. Add family size portions to freezer containers, label, and stick in the freezer. When ready to serve: Let thaw overnight (or heat from frozen), heat in skillet or microwave, add to tortillas, tortilla chips, or a salad! Create a taco bar by placing all the toppings on the counter for everyone to create their own. Try just these 2 meals to get started with freezer cooking. These will be tasty meals that will keep you family fed and happy, and keep you out of the kitchen and enjoying time with you family. One of my favorite parts about freezer cooking is that you only have one large set of dishes to do. Everything else is pretty mess free! Beginner freezer cooking is totally do-able. Just start with baby steps and try these easy 2 meals first. Make these for a couple of months, and when you feel comfortable and you’d like to try a few more, come back and try this no cooking freezer cooking plan and make 18 meals in 30 minutes. What are your favorite beginner freezer cooking meals? P.S. 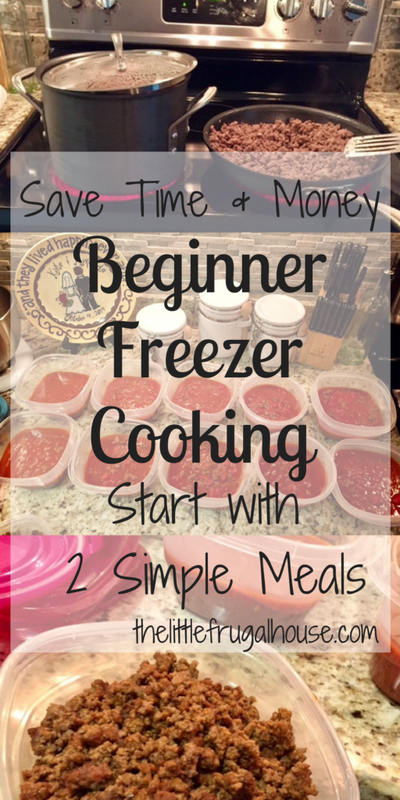 Be sure to check out the MyFreezEasy program if you are interested in learning more about freezer cooking. You’ll find customizable meal plans to get 10 meals into your freezer in about an hour! There are 5 different meals plans each month, with something for everyone. Meal plans come in a printable download with recipes, shopping lists, assembly instructions, videos, and printable labels. These plans are designed for beginner freezer cookers and more experienced cooks – really anyone who wants to skip the overwhelm of feeding their family delicious and healthful meals every night. Check it out!